So Spring is here and finally we say goodbye to another winter, with it’s short days, cosy afternoons and buckets of hot chocolate. Personally I’m a little relieved as although winter is always a wonderful time for celebration, feasts and reflection, I find the hope and energy Spring brings to be so uplifting and exciting. Although of course Spring likes to keep us on our toes and although the days begin to lengthen it almost always showers us with a flurry of short-lived snow storms, hail, cold rain and thunderstorms. The saying, “March comes in like a lion and goes out like a lamb” is certainly very true in this part of the world anyway! However by the time March comes to a close, this month has given us much more day length (part of the reason the Saxons called it Lentmonath meaning lengthening month.) and the landscape around us is in a flurry of transition and growth. The Spring or Vernal equinox, celebrated on the 20th of March is when the hours of daylight are equal to the hours of darkness. A time of balance but soon the light wins out and those long dark evenings are a thing of another season. It is now a time for new beginnings, of birth and fertility. Spring reaches a climax in May, starting with Beltane or May Day on the 1st, the halfway point between the spring and summer equinox. Anglo saxons called May Thri-milci as the cows produced so much milk during this late Spring period. So let’s dive into the delicious food that Spring provides our seasonal plates with. Now, Spring starts off with a hunger gap while we wait eagerly for the new seeds to germinate and start producing but it isn’t long before the wild food from hedgerows and fields begin to flourish. It begins with the allium family, wild garlic in woodland areas with it’s pungent scent and the milder three cornered leek nestled by rivers. Nettles soon follow, bursting with easily assimilated minerals and a true spring tonic. Then there are the flowers! Violets, dandelions, daisy, broom and cultivated primroses, all providing cheer to the spring foragers table. By the time May rolls by the garden is producing plenty; pea shoots, asparagus, young carrots, cauliflower, lettuce, radish, sea kale, sorrel, watercress and outdoor rhubarb to name a few. Depending on the weather you may even be able to start picking elderflowers in May for cordials, fritters and syrups! It’s a truly beautiful season in the kitchen, one that makes us all appreciate good food, and fresh local produce. 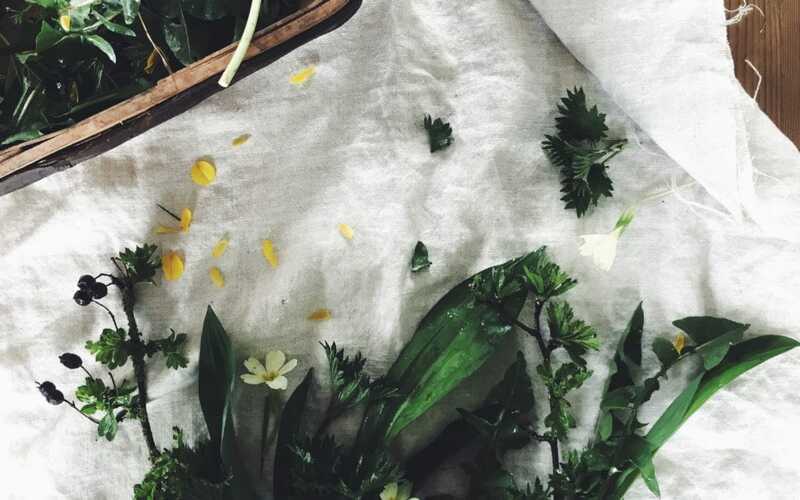 Some of my favourite Spring recipes are edible flower syrups to infuse into sponge cakes, vibrant wild green pestos, simple omelettes with nettles and dandelion leaves, gently steamed spring greens such as purple sprouting and asparagus finished with lemon and olive oil. A celebratory Easter cake, compotes of tangy rhubarb softened with vanilla and simple salads dressed well and sprinkled with edible flowers. So what about the Spring garden? Well, After a long winter of reflection and planning Spring suddenly hits us with a ton of gardening jobs, in our case sowing seeds and prepping beds! I always crave the start of the sowing season but the reality is that I’m usually doing it with chilled fingers as the rain pours down! But nevertheless it is very exciting to finally get going again, surrounded by soil and seed packets and with the expectation of new growth, flowers and food in a few weeks time! To begin Spring I plant chillis, peas and broad beans followed quickly by rocket, salads, and soon every container has been used and we are ordering more plant labels in a rush! I always like to plant an array of flowers too. Some for the cut flower patch-sweet peas, cosmos mainly and then edible flowers, violas, nasturtium, calendula, chamomile. I also plant a decent amount of herbs; things like parsley, corinder and fennel although this year I am excited to experiment with some different varieties of mint too. Spring in the garden also brings a bit of fustration, at least to me and I find myself wishing for a full time gardener to come help me bring my ambitious garden dreams to life! Maybe next year! Another lovely thing about this new season is that Walks around the farm suddenly become more attractive come Spring. First of all theres the joyful nodding heads of daffodils, followed by plenty of spring bulbs, bright gorse flowers, willow buds and then frogspawn to spot in the river. Soon it’s time for Bluebells, wild garlic, young nettles, butterflies and bees followed by an array of wild flowers such as daisy, buttercups, foxgloves, borage, cow parsley and hawthorn flowers. I almost always bring a wicker basket on my daily spring walks to stock up on a spring posy and something yummy to transform into lunch later. By the end of Spring the cows and goats are back outside after a long winter sheltering indoors and its always a happy sight seeing them sunbathing in the warm spring sun and enjoying that rich grass! One of my favourite things about Spring is the birdsong. The Dawn chorus becomes louder throughout spring culminating in International Dawn Chorus Day in May when it supposedly reaches it’s peak. The chorus can start as early as 4am with blackbirds, wrens and robins starting it off, followed by the song thrush, chiff chaff and black cap, the late arrivals to the dawn chorus appearing before 7am include the chaffinch, house sparrow and goldfinch. In mid April the Cuckoo arrives back from African with it’s unmistakeable song and by the end of Spring we see the return of our swallows, swifts and house martins. I have a new seasonal treasure hunt pdf for you all, which is now available to download here; Download the Spring Scavenger Hunt PDF (right click and download) This contains a list of all the lovely natural things you can see on your walks and is a great companion for the season and wonderful to complete with kids too! I’d love to hear your thoughts, so do leave a comment below and join in the conversation! PS: if you are looking to get started with Natural living, be it making a spring herbal vinegar, reconnecting back to nature or detoxing your bathroom and making your own DIY toothpaste I have the ultimate resource for you. Its my Natural Living eCourse which is crammed full of fun and inspiring ideas and projects to get you living a seasonal and natural life! If your interested then check it out! Subscribers to my email list will receive a little discount so be sure to sign up for the seasonal newsletter too!